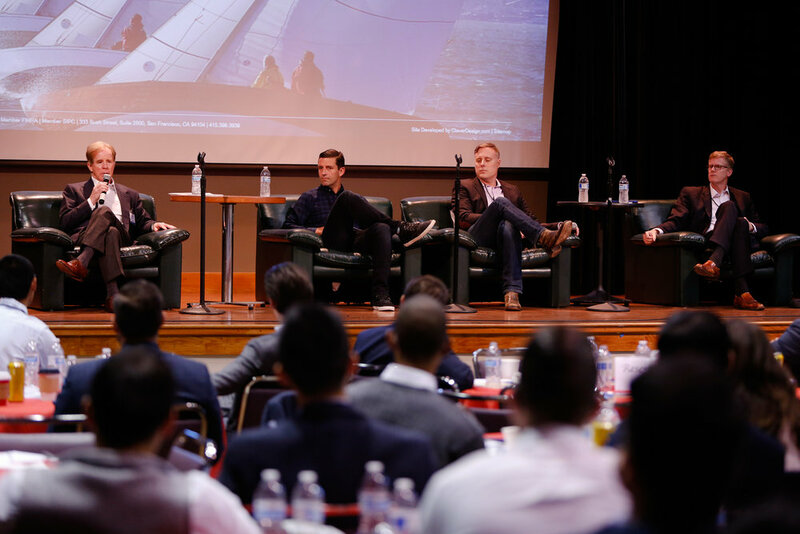 The largest student-run investment conference on the West Coast. Alison Shimada is a senior portfolio manager and head of the SF Global Emerging Markets Equity team at WFAM. She joined the firm in 2003 after serving as an investment officer of the University of California Regents-Office of the Treasurer. Prior to her current role, she served as a senior analyst covering areas of developing Europe and Africa for three years with the firm. She began her responsibilities at WFAM as the head of equity research for the developed markets (EAFE) international equity team and as a senior investment analyst for Japan and Australia/New Zealand. She began her investment industry career in 1985, and her prior experience also includes serving as a portfolio manager specializing in Malaysian equities at Commerce Asset Fund Managers and as a senior equity analyst covering Japanese securities at Fidelity Investments Japan. Alison earned a bachelor’s degree in political economies of industrial societies from the University of California at Berkeley. She earned a master's degree in business administration from Harvard Business School. From 1995 until 2004 Andy was a co-founder and General Partner of Benchmark Capital. Upon his retirement from Benchmark, Andy joined the faculty of the Stanford Graduate School of Business to teach a variety of courses on technology entrepreneurship. In 2011 he co-founded Wealthfront Inc. where he now serves as President & CEO. Prior to his 10 years at Benchmark Capital, Andy spent 10 years with Merrill, Pickard, Anderson & Eyre. Andy serves as trustee of the University of Pennsylvania, a member of its executive committee and Chairman of its endowment investment committee. He also sits on the board of the Damon Runyon Cancer Research Foundation with whom he and his wife partnered to provide funding for early career investigators to conduct high risk/high reward research to significantly impact the prevention, diagnosis and treatment of cancer. Andy earned his BS from the University of Pennsylvania in 1980 and MBA from the Stanford University Graduate School of Business in 1984. Dr. Yost-Bremm is an assistant professor of finance at San Francisco State University. He studies algorithmic trading strategies in global markets using econometrics and machine learning methodologies. Prior to academia, he held quantitative trading positions at BlackRock, Lehman Brothers, and a number of proprietary trading firms. Kathleen joined Rosenberg Equities in 1999 and has held a number of positions within the firm including Portfolio Manager, Head of Investment Modelling and Deputy Chief Investment Officer for the Americas and most recently, Head of Research and Investment. Kathleen obtained her Bachelor’s degree from Harvard University in 1999 and earned her MBA from Duke University in 2006. She has earned an Investment Management Certificate and is a CFA charterholder. Kathy has over 30 years’ experience working with commercial property owners to acquire, redevelop, manage and sell their properties. While her expertise is largely based in asset and property management, she has been involved with every facet of the industry over the years. Recently retired from full time employment, Kathy remains active in BOMA San Francisco, serving on the PAC Board and the Foundation Board. Kathy has been active with the CREATE effort to introduce college students to the many career opportunities in commercial real estate. She was a lecturer at San Francisco State University from 2015 to 2018, and is currently chairing the curriculum committee and teaching in the CREATE Commercial Real Estate Fellows programs at SFSU and Merritt College. Kathy is also a real estate consultant, taking on occasional assignments to assist building managers and owners with special projects. Prior to that, she held the position of Director of Asset Services for CBRE in San Francisco. This position allowed Kathy to combine her previous experience in both asset management and property management that goes back to 1983. With experience in all areas of real estate, including office, retail, industrial and healthcare asset and property management, Kathy is part of the “Forever Influential” group of women honored by the San Francisco Business Times. She was also recipient of the Ray C. Nann Award for Distinguished Service from BOMA San Francisco. Probitas Partners he was Chief Operating Officer at Pacific Corporate Group where he oversaw the partnership investment program which oversaw more than $20 billion in capital dedicated to private equity globally. Before joining PCG, Kelly held various senior positions at First Interstate Bancorp, including management of a $170 million private equity portfolio and oversight of all financial derivative activity in the corporation. He has a MBA from the UCLA Anderson School of Management and a BA from Stanford University. Probitas Partners is a global provider of alternative investment solutions with an emphasis on the placement of private equity, private debt, real estate, infrastructure and real asset funds. Probitas operates from offices in San Francisco, New York, London and Hong Kong. Mark Carlson joined Stockbridge in 2007, and leads property acquisitions in the Western United States. During his tenure, Stockbridge has closed approximately $6.7 billion of acquisitions, including product types across the risk spectrum from core to value add to development. Additionally, Mr. Carlson has experience in portfolio management, disposition, leasing and management involving all major property types. Prior to joining Stockbridge, he was a Partner and Managing Director of RREEF, where he managed the firm’s West Coast acquisitions group and was a member of its North America Investment Committee. Beginning in 2003, Mr. Carlson assumed direct responsibility for the acquisition of RREEF’s office, industrial and retail investments in Southern California, and closed over $3 billion in transactions during the succeeding four years. Mr. Carlson joined RREEF in 1994 in the Property Management Department. From 1996 to 2000, he oversaw the Dispositions Department, which closed over 400 transactions with a total cost of $6 billion. From 2000 through 2002, he was part of the Portfolio Management Department, responsible for developing and implementing investment strategies for specific clients. Previously, Mr. Carlson served as a principal of Equity Resource Group, a company that he formed in 1988 which developed investment partnerships for the purchase and management of commercial and residential properties. He began his career with Coldwell Banker Commercial Real Estate in San Francisco as an office leasing broker. Mr. Carlson received a degree in Business Administration with a real estate emphasis from the University of California at Berkeley. He is a certified Commercial Investment Manager and a member of both the Institute of Real Estate Management and the Urban Land Institute. In the 1980’s, he represented the United States playing rugby for the U.S. National Team. Miguel Cota, Vice President, is a member of the Trading & Liquidity Strategies business within BlackRock. He has traded across assets including equities, credit, commodities and derivative products for multiple portfolio teams across the firm including systematic and fundamental groups. More recently he has rejoined the Model Based Fixed Income group to focus on trading investment grade and high yield credit and credit derivatives. Prior to his career in finance Miguel played guitar for an indie/punk rock band in Southern California. Mr. Cota is passionate about "leveling the playing field" and serves as one of the west coast chairs for MOSAIC and SOMOS, internal employee networks aimed at moving BlackRock’s Inclusion and Diversity efforts forward. Niklas Nordenfelt is managing director, senior portfolio manager and co-head for the Wells Fargo Asset Management (WFAM) U.S. High Yield Fixed Income team. Niklas joined the team in February 2003 as investment strategist. He began his investment career in 1991 and has managed portfolios ranging from quantitative-based and tactical asset allocation strategies to credit driven portfolios. Previous to joining the firm, Niklas was at Barclays Global Investors (BGI) from 1996-2002 where he was a principal. At BGI, he worked on their international and emerging markets equity strategies after having managed their asset allocation products. Prior to this, Niklas was a quantitative analyst at Fidelity and a portfolio manager and group leader at Mellon Capital Management. He earned a bachelor’s degree in economics from the University of California, Berkeley, and has earned the right to use the CFA designation. Mr. Pertel is a Senior Managing Director and Co-head of the San Francisco office of HFF. He leads the Investment Advisory group for San Francisco, overseeing all asset classes. Mr. Pertel’s primary investment advisory focus is on investment sales and equity placement of industrial product in the Western U.S. Mr. Pertel also has extensive experience in the cold storage industry and net leased asset class throughout the US. Mr. Pertel is an active board member and past president of NAIOP’s San Francisco Chapter (2016), Chair of the Young Professional Group and sits on NAIOP’s national Board of Directors. Stephanie Shu is an experienced Portfolio Manager with 20+ years of experience. She believies in a systematic/quantitative/innovative investment process, and has managed over 5 billion active/factor-based strategies. She specializes in strategy design/portfolio construction. Ted Janus, principal of J Capital, invests in private and public equities in both the financial services and consumer sectors. He also invests in private equity funds and hedge funds. Mr. Janus holds a BA in Political Science and an MBA from the University of California, Berkeley, where he currently serves on the Board of the Haas School of Business.